DRIVING IS FOR THE SHOW...YOU WILL MAKE MONEY ON THE GREEN !!! 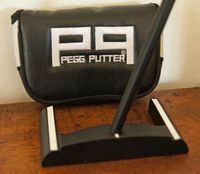 PUTTS LEFT SHORT NEVER GO IN..YOU CAN NOW CONCENTRATE ON THE ROLL !!! PEGG PUTTER 2.0 - NEW C35 STEEL RAIL SHAPE HEAD FORGED IN ITALY - 495 g for a HIGH MOI - SELF STANDING - CHOICE OF 2 GRIPS- Flat milled face - Conform to the rules of golf by R&A and USGA. Available Standard Shaft lenght: 33 " 34" 35"
TO ORDER AND SEE DETAILS , FOLLOW "Info"
TO ORDER AND SEE DETAILS , FOLLOW "Info" below.